A Film Review by Jay F. Miller. 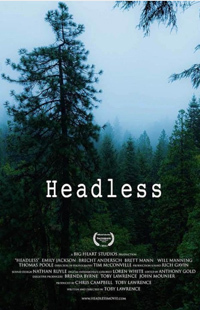 Headless is a terror-suspense thriller by writer/director Toby Lawrence. Not a splatter opera. Instead, a good-looking terror-suspense film that’s ominous, compelling and occasionally funny with a well-acted lead and an unsettling twist. In the supernatural thriller Headless, Marie uncovers a 150 year old legend that’s similar in religious fervor and violence to her own sister’s barbaric, unsolved murder. We follow Marie to the remote woods of Milburn’s Gap where her sister’s body parts were found. Marie must contact the proprietor of the town store, Freddie Jones (Brecht Andersch) who owns the land where the old legend took place. At the store, all the warning signs of danger are present in a tense scene of psychological cat-and-mouse with the suspicious store owner. Marie cruises through aisles of plastic road food and truck stop tchotchkes, cautiously sizing up the strange troll-man behind the counter. When Marie asks to visit his land where the grizzly events of the legend were to have taken place, Jones suggests that she follow him home after he closes his store for the evening. Marie reluctantly agrees. Alone in the store’s restroom, Marie melts down, shaken by the realities of the dangerous odyssey she’s committed herself to. Director Lawrence creates a backdrop of old time religion, superstition and righteous fear with a dialogue of authentic-sounding religious fervor that is without a hint of snicker. Unlike the stories of Jason, Michael or Freddy, there is no singular villain or horrific serial killer here. We are fighting a perpetual conflict, an unseen force that promises to reign terror down if one is not ever-vigilant. This is a life lived in fear—a fear of the unknown. Actor Emily Jackson never allows us to disbelieve in Marie. She is a crusading hero, descending into very dark depths in the tradition of Halloween’s Jamie Leigh Curtis and Alien‘s Sigourney Weaver. Marie is not deluded by the unsafe choices she makes. She places herself in jeopardy in order to correct an injustice, to right a wrong. The color and cinematography (by Tim McConville) is satisfying and rich. Hand-held close-ups are revealing and dialogue and exposition are held to a minimum. A simple scene of Emily hanging up a coat in an unfamiliar house exposes her inner dread and apprehension. The soundtrack is sophisticated, much of which is written and performed by writer/director Lawrence, including some good-old fashioned lo-fi hymns that add gritty texture to the setting. Headless is a film where sometimes right is wrong and wrong is right, and it’s not what is said, but what goes unsaid that is most telling. Settle down with your popcorn and Milk Duds for this delicious creep-fest with an unsettling conclusion. It’s a film that may even deserve a second viewing, and rumor has it that a prequel of more than one hundred years is in the works. Happy dreams, dear horror lovers. This entry was posted in Art and Book Reviews, Building Brands and Brand Nations., long copy, Movie Reviews, Writing and Copy and tagged Copy and Writing, Writing and Copy. Bookmark the permalink.